In a way, this tree describes my attempts to discover Australia so far. Perhaps because I had no idea what I was doing, I started my trip up the coast in a town named Mooloolaba after flying away from the cold southern air of Melbourne. 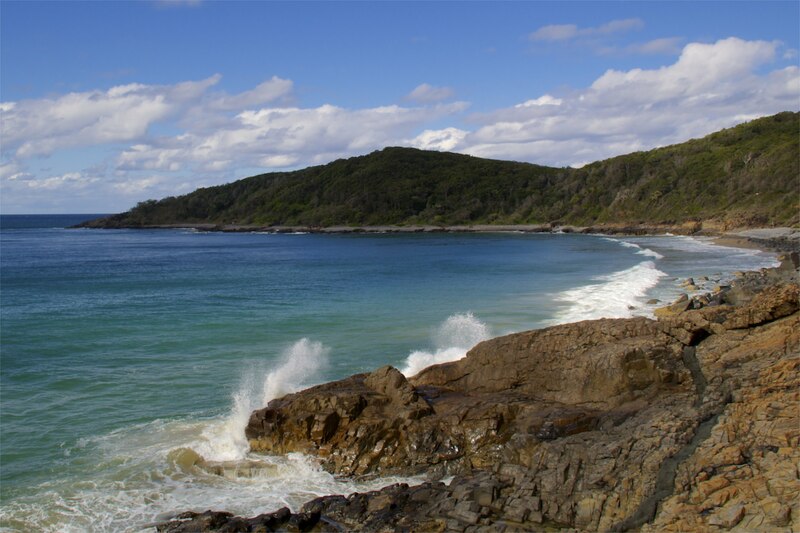 I had partially assumed that I would start in this place, north of Brisbane, and slowly work south along the major beach cities on my way to the Gold Coast. Instead, I should have flown into the Gold Coast and worked my way north up towards Mooloolaba (and further). If I was keeping track, this may be the third or fourth example that I’ll be able to point to later when discussing how poorly I planned the Australian leg of this trip. 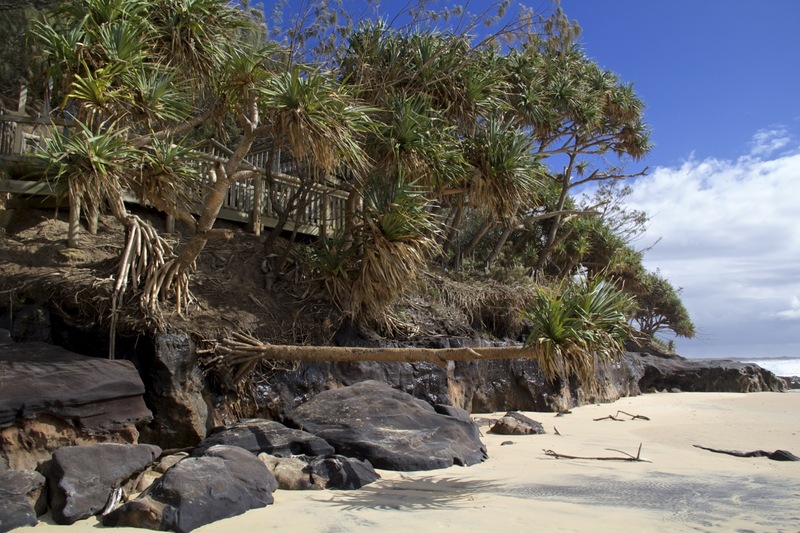 Upon arriving in Mooloolaba, I checked into my hostel and set out to discover the town…although I had a bit of a discovery in my hostel first. I discovered that it was a bit of a dive. Here’s the review I left on Hostelworld after I left. Expensive in-house wifi; Use the free wifi up the street at Coffee House. Laundry facilities looked pretty rough. Free breakfast was more than enough. Fridges needed a serious cleaning – saw a jug of milk that was more a jug of cheese. Some of the beds and pillows have seen better days – the first bed I was in had scoliosis and looked like a “U”. Overall hostel was about the same as you’d see in many other Australian QLD coast cities. 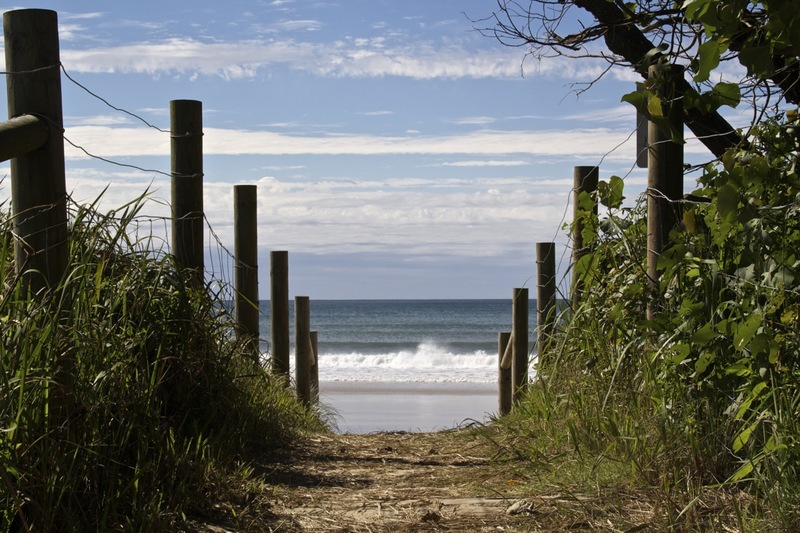 I started out exploring Mooloolaba with the help of a local. Through a post I put on Couchsurfing, I spent a few hours in the afternoon getting shown around town by a local girl named Bree who had just returned from a multi-month trip in Europe. She drove me around and showed me a few parts of town that I wouldn’t have discovered from simply walking around on my own. Overall a pleasant first day. Later that night for dinner I went to a Thai place she recommended as one of the best places in town – although it pained me to pay $12 for a plate of pad-thai, the food was pretty good. 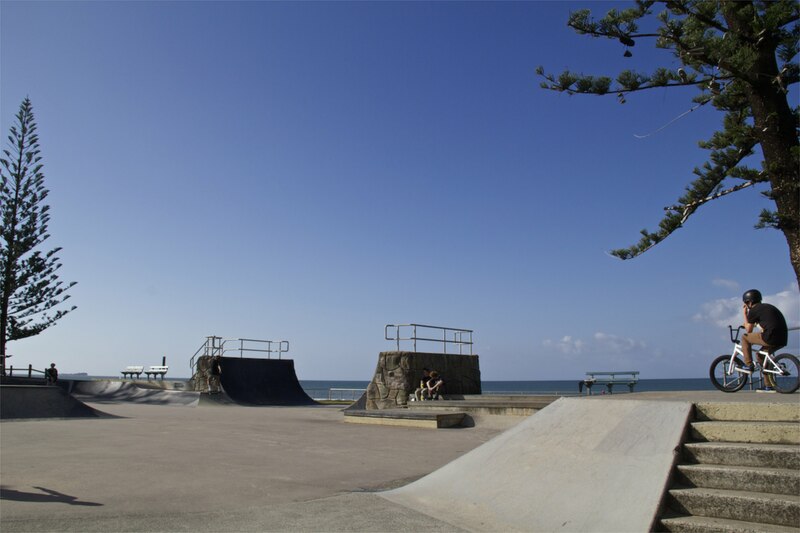 The next few days in Mooloolaba were spent doing one of four things. Walking around the beach taking pictures: This is fairly self-explanitory. Shopping: I purchased a new camera battery charger after realizing in Melbourne that I left it somewhere in Asia. It turns out that the new charger didn’t work. I found another one to buy in Mooloolaba. It works. I’m happy. I also purchased two new pairs of shorts since the ones I started this trip with no longer fit. As I’m back in shorts weather – this was pretty important. Figuring out what to do in Australia: This doesn’t need an explanation either. 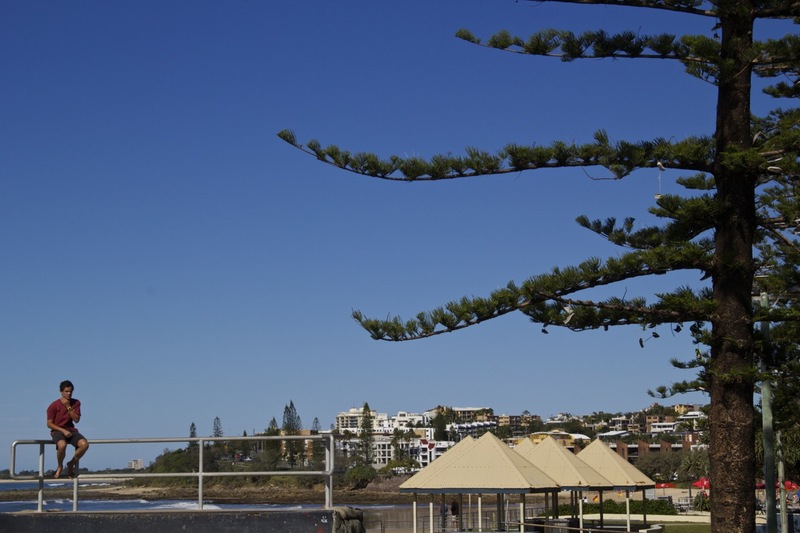 Running: Mooloolaba is a very outdoorsy town. 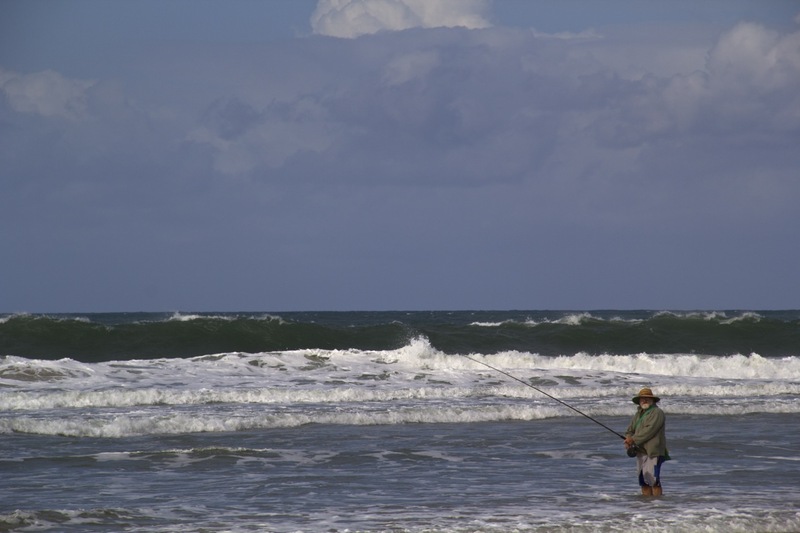 In fact, the only thing anyone seemed to be doing all day was shopping, sitting at a cafe, surfing, or running on the trails along the beach …or just on the beach. I was able to go running almost every day and it was good to put in a few 6+ mile days. 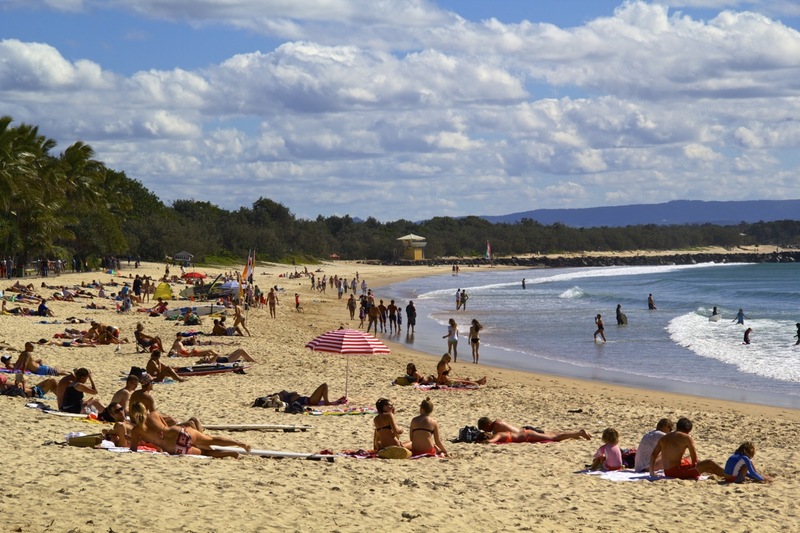 Getting from Mooloolaba to Noosa is a simple $15 bus ride that takes about an hour. 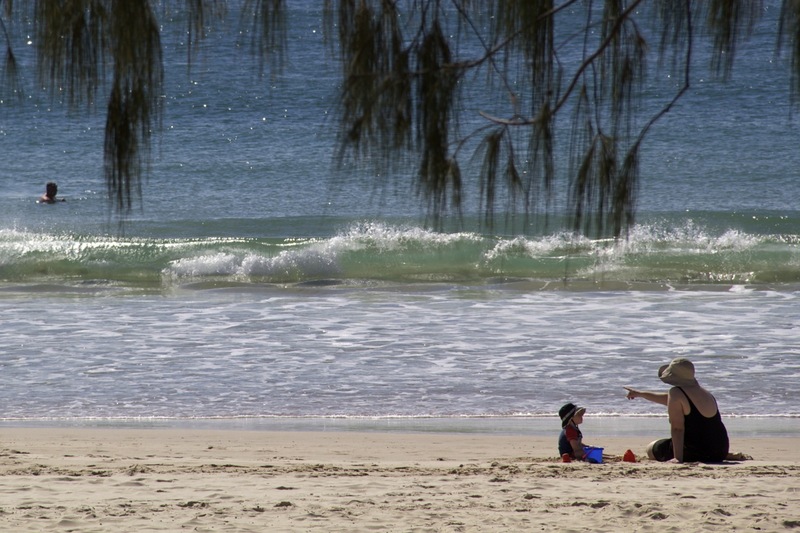 The bus runs every 30 minutes, so it’s entirely possible to visit Noosa as a day-trip from Mooloolaba. As I typically do, I opted to get up early and get to this new town fairly early – I was there by 10:30 AM. …Unfortunately check in at the next hostel was a very strictly enforced time of 1 PM, so I was going to have to hang out for a while. Typically when this happens it isn’t the end of the world – just leave your bag in the luggage room and head out and go about your day. As it turns out there was no luggage room at this hostel, but I was free to leave my bag “in the bar” – something I opted to not do. Instead I sat at a coffee shop (with no wifi sadly) for 2 hours and killed some time. Eventually I was able to check in and discover that the lockers available at the hostel were not free to use. Normally when booking a hostel I look to find places that have lockers as a listed amenity since this typically means there are lockers available to use in the rooms. Oh well. 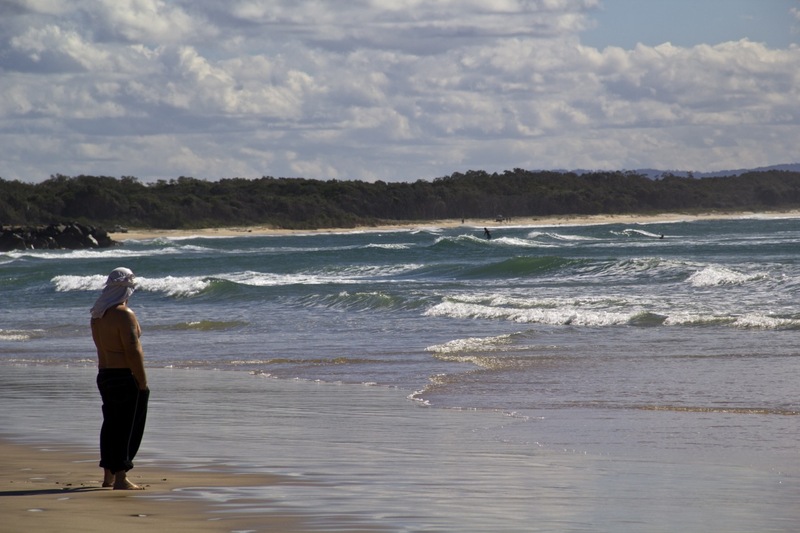 In addition to the typical things to find in Noosa (beaches, trails, surfing, staring at the water), I met two fascinating human specimens. The first was a 19 year old boy (staying in the same room as me) from England who had apparently managed to spend his last dime on traveling around Australia (…and a lot of alcohol) and was now heading to Brisbane on a bus to go to the airport. He didn’t have a flight from the airport in Brisbane, but instead was waiting for his parents to buy him a ticket back home to England. The second was a guy that may or may not have been mentally challenged, but was absolutely drunk. Security apparently only let him into the hostel bar/club on the condition that he drank two glasses of water before having a beer. I met him with two glasses of water in his hands. I think he was talking about having a boat and asked the girl I was talking with at the time if we wanted to go out on the boat with him tomorrow. Later the next morning, after talking to a few travelers, I decided to buy a hop-on/hop-off bus pass that would take me to Cairns from… a city a whole lot further south from where I already was. Australian screw-up #5 at this point, but at $200 this was still a pretty good deal. I also decided that morning to leave this hostel a day early and head north to a place called Rainbow Beach for a few days. 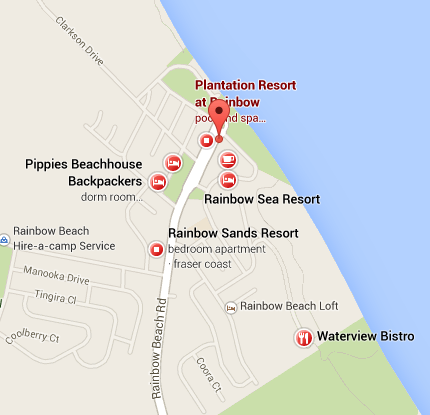 To say that Rainbow Beach is a small town would be to insult the size of small towns across the world. Rainbow Beach is a street with roughly 10 shops between both sides of the “main strip.” You can see the main road in the middle of the map above. On the main strip you can find: a small grocery store, a pharmacist, cafe, travel agent, surf shop, a hotel bar/diner/restaurant, and an ice cream shop. 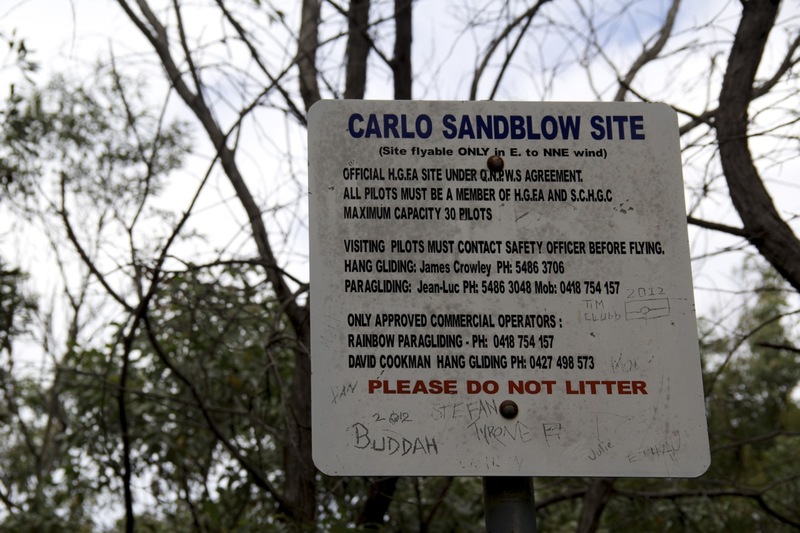 Rainbow Beach is not really a tourist destination – instead it’s the town closest to a tourist destination. 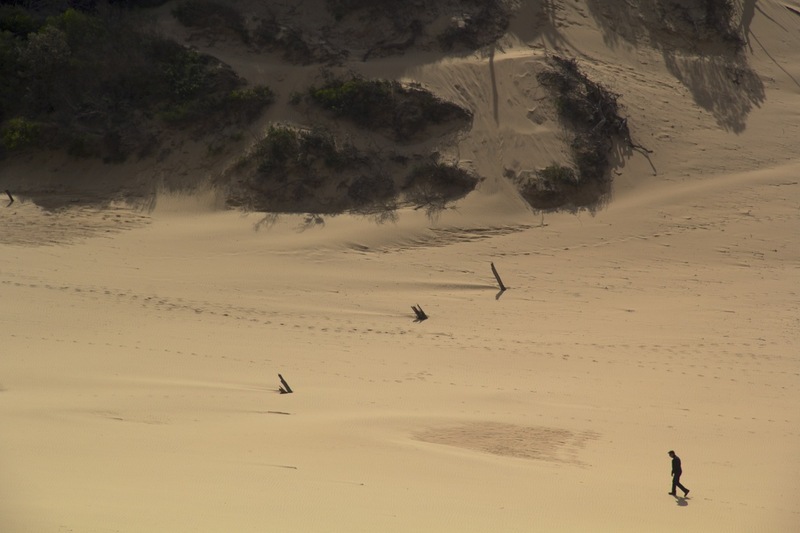 Many people are here just for one or two nights on their way to or from Fraser Island. Tours of the island are $400 for 3days/2nights, so I decided to skip the island. Instead I did what I always do – grab my camera, walk around, and find myself in situations where I make bad decisions. 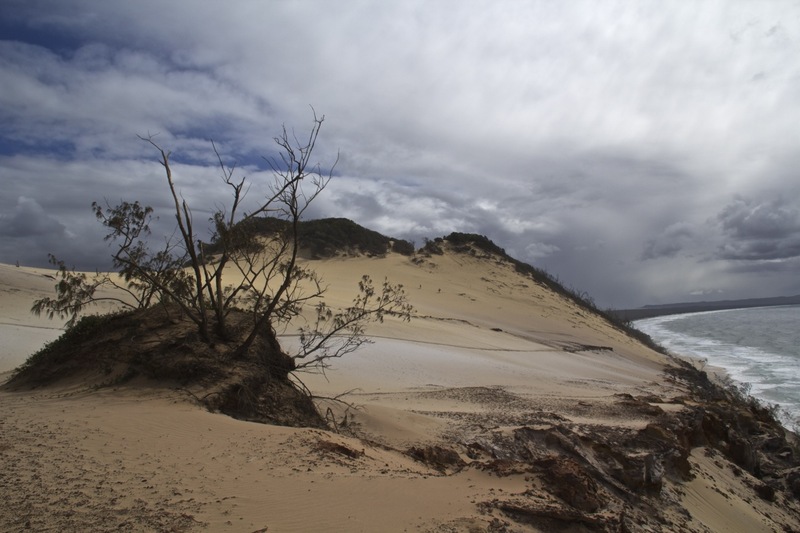 The specific bad decision of the day on Rainbow Beach was that I decided to climb up a steep sand wall instead of turning around when it was clear that rain was coming and I was at least an hour from shelter on the beach. 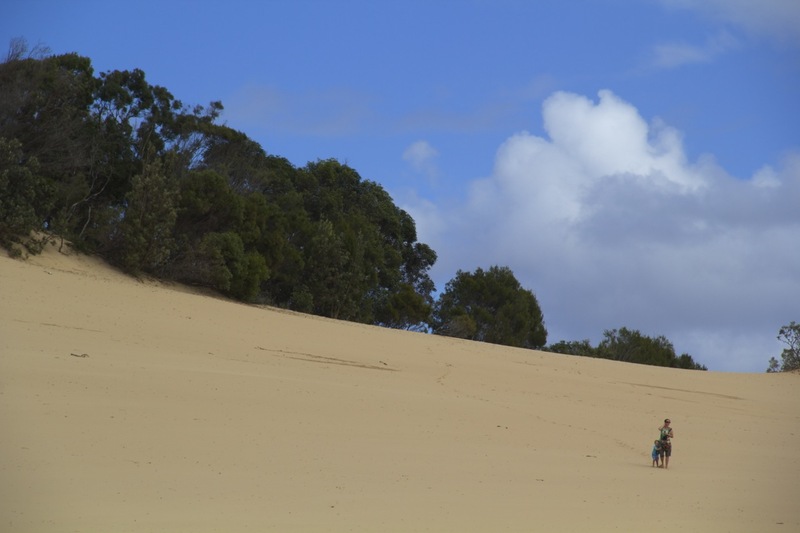 After climbing up the sand wall – which was actually quite entertaining because you were constantly sliding back down the hill with each step you took – I discovered a large forest that I would have to go through next. (Or just go back down the cliff…) Without knowing how far up through the hill I was going to have to walk, I decided that I would press on and see what happened. As I put my foot down into shin-high brush and foliage over and over again, I couldn’t help but thinking of how many of the world’s most dangerous snakes and spiders are found exclusively in Australia. After about 15 minutes of this I pulled out my phone to take this picture. 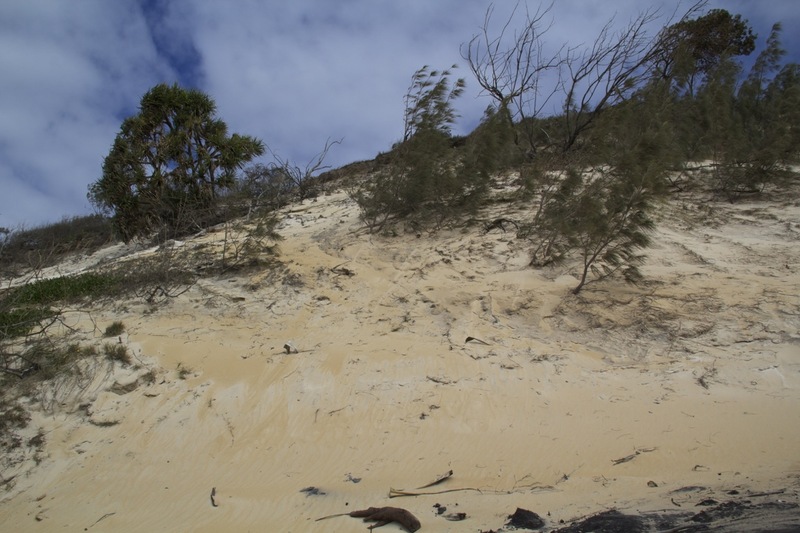 After another 20 minutes or so of hiking – it’s clear to see why this sandblow is so highly regarded. Simply stated – it was awesome to see, massive in scale, and mind-numbing in the immediate contrast between the white sands and blue sky. 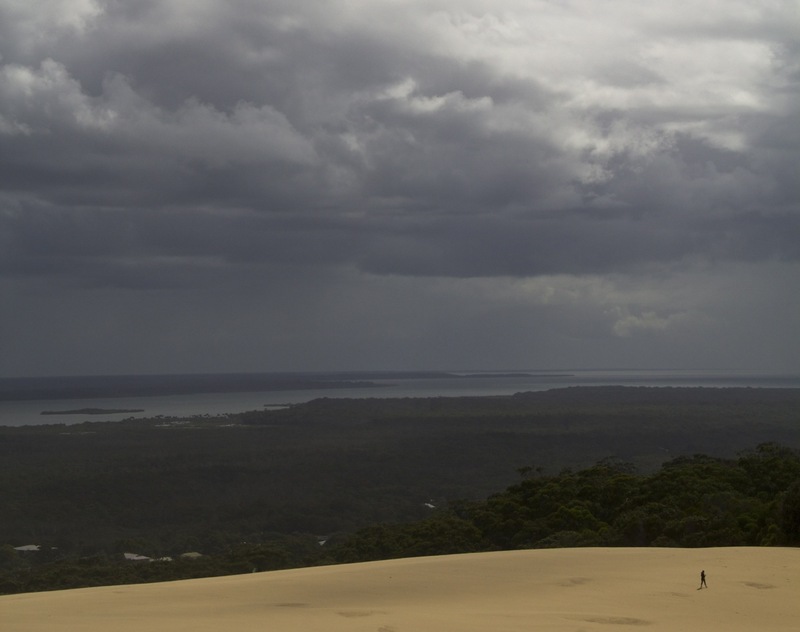 During the two hours I spent walking around the sandblow I was actually able to see the weather change as clouds came in – giving me an opportunity to get another perspective on the sandblow. I took a ton of pictures walking around, but the ones below are the ones I like the most. So now what? At the moment I’m waiting for an evening bus to take me from Rainbow Beach to a town named …oh hell I’ve forgot where I’m going actually. I think it’s called Arlie Beach. 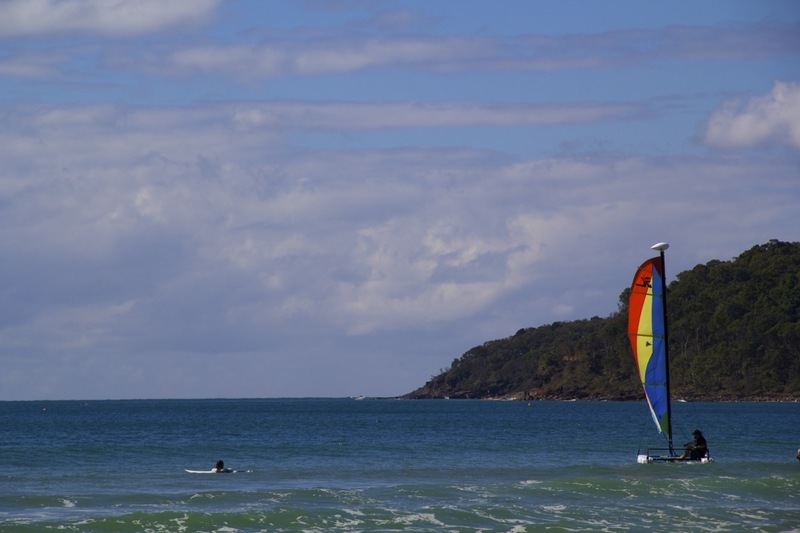 Arlie Beach is similar to Rainbow Beach in that it’s primarily a launching point for a major tourist destination – in this case trips to the “White Sunday” islands. (Spelled “Whitsunday”) 2 and 3 day trips start around $300 so it’s doubtful that I’ll go on any officially organized tours of the island. Arlie Beach is supposed to be a picturesque town with blue waters and a backdrop of hills and mountains. I’m not actually sure how long I’ll stay there, but I’ve booked two nights in a hostel. I’m starting to get closer to warm weather and warm water, so I’m hoping that I may be able to break out my snorkel equipment soon. 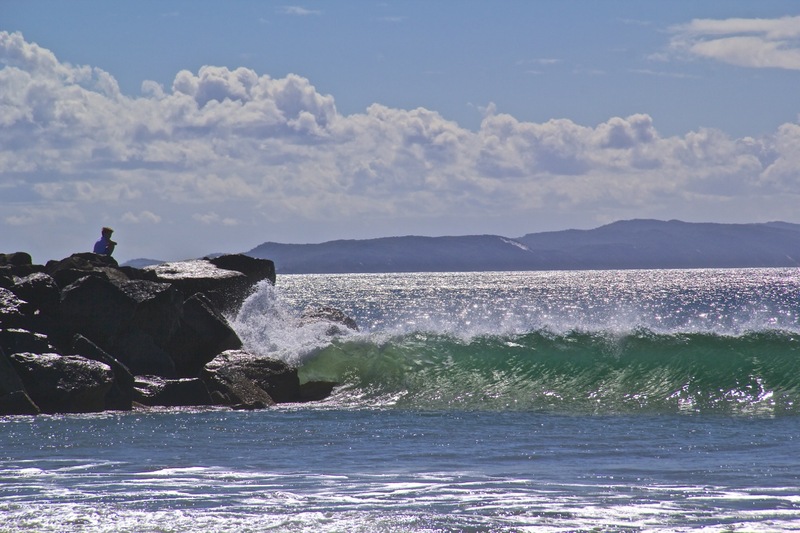 This entry was posted in Australia, What's up with Mike, When Planning Goes Wrong and tagged Australia, Backpacking, beach, Beaches, Couchsurfing, Mooloolaba, Mooloolaba Queensland, Noosa, Queensland, Rainbow Beach, Surfing. Bookmark the permalink. Hi Baby…. are you at a point where we can call you a Nomad? Love the descriptions and honesty of your posts. Love and miss you, Mama!